How are Sea Birds Affected by Ocean Plastic? I’ve already discussed how marine animals and corals are affected by pollution, but what about animals that don’t live in the sea? 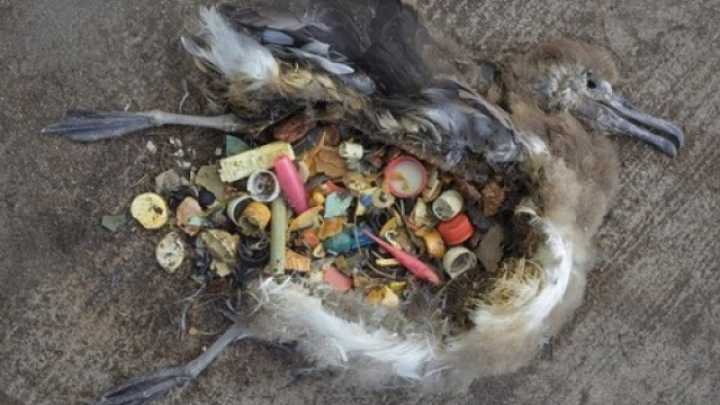 Countless sea birds have died due to an excess of plastic in their stomachs, and this needs to stop! Ok, so what makes sea birds so valuable? Well, they give scientists information on a variety of subjects. Tracking seabirds gives them information on where they clash with offshore developments and fisheries, as well as popular feeding spots which can affect other animals. Aside from how seabirds benefit us, they are essential to their ecosystems as well. They not only help maintain population levels of various organisms, but also are a key factor in plant life spreading throughout islands. Sea birds can also give us information on the sources of plastic pollution, which is extremely vital to preserving all life. Scientists use them to collect data on the sources of plastic pollution. Birds travel vast areas and pick up plastic all over the globe, then feed it to their chicks. Dr. Jennifer Lavers studies this phenomenon, particularly in shearwaters. She uses a saltwater solution to make the chicks regurgitate the plastic, then she analyzes it. She shares her work in the documentary A Plastic Ocean, which shows many birds killed from mass amounts of plastic in the stomach. The worst case she’s documented was that of a 90-day old chick with 276 pieces of plastic inside of it. When weighed, this totaled 15% of the bird’s body mass. The human equivalent of this would be 13-17 pounds (6-8 kilos) of plastic ingested. Another danger to sea birds is bycatch. Sea birds hunt in areas with a high concentration of fish, and so do people. According to a study done by the Biological Conservation journal, every year an estimated 400,000 seabirds are killed by gillnets worldwide. However, steps are being taken to reduce this bycatch. Longline fisheries have begun adding weights to branch lines to make them sink faster, attaching streamers to the lines to scare birds away, and setting lines in total darkness when the birds aren’t hunting. If all of these actions are taken, the mortality rate of sea birds caught by long line fishing vessels is reduced up to 90%! Unfortunately the majority of fisheries are reluctant to embrace these methods, but there is hope. Many efforts have been made to protect sea birds from bycatch, and I’m sure we will continue to make progress. Click here to learn about some of the steps taken to protect these beautiful creatures. Thank you so much for reading! Every person has a voice, and we need to use our voices to speak up for those that can’t defend themselves! As Craig Leeson said, “We’ll share this story, because from knowing comes caring, and from caring comes change.” If you would like to help me help animals, please subscribe to receive emails with each post and share this with your friends. Remember to recycle! International, BirdLife. “Protecting Seabirds and Marine Ecosystems.” BirdLife, http://www.birdlife.org/europe-and-central-asia/protecting-seabirds-and-marine-ecosystems. A Plastic Ocean. Dir. Craig Leeson. Perf. Dr. Bonnie Monteleone, Dr. Lindsay Porter, Jo Ruxton, Tanya Streeter. 2016. Film. Dulaney, Jordanna. “Nearly Half a Million Seabirds Die in Gillnets Every Year, but Solutions Exist.” Conservation News, Conservation News, 18 Nov. 2013, news.mongabay.com/2013/11/nearly-half-a-million-seabirds-die-in-gillnets-every-year-but-solutions-exist/. “Reducing Seabird Mortality.” Australian Government, Department of the Environment and Energy, Australian Antarctic Division, 21 Apr. 2016, http://www.antarctica.gov.au/science/conservation-and-management-research/southern-ocean-fisheries/seabird-bycatch/reducing-mortality.